Utility jacket worn by James Mosel in Vietnam. Part of fulfilling our museum’s mission to commemorate Wisconsin veterans includes gathering as complete a story as possible in our donation process. Ideally, we supplement our object collections with archival components like letters and photographs and vice versa. When Vietnam veteran James Mosel of Chippewa Falls partook in an oral history interview last August, interviewer Rick Berry—also a long-time volunteer cataloger in object collections—well understood the importance of creating these links and encouraged Mosel to donate artifacts to the museum. Mosel obliged and gave both his utility jacket and KA-BAR knife shortly after, providing a tangible complement to his personal story. Mosel enlisted in the United States Marine Corps in 1967, training at the Marine Corps Recruit Depot in San Diego as a rifleman before heading to Camp Pendleton and Scout Sniper School where he graduated with an expert badge. He was sent to Vietnam in March of 1968, assigned to Headquarters Company, 1st Battalion, Seventh Marines as a scout sniper. Several months later in August he received his second wound when he was shot in the right hip and had to spend four months recovering at a hospital in Japan. He was then reassigned to Delta Company, 1st Recon Battalion, designated the team leader of call sign “Grim Reaper”. Mosel was involved in six major offensive operations during the 1968-1969 period he was in Vietnam. He recalled wearing this jungle utility jacket “in excess of 100 days in the jungle on the Laos/Vietnam boarder on long range recon patrols”. 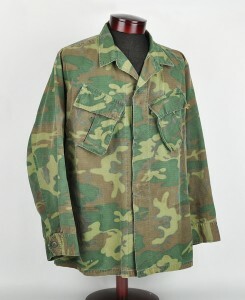 The so-called ERDL camouflage pattern seen here—named after the Army’s Engineer Research and Development Laboratories (ERDL) which first designed it in 1948—appears in the original general purpose green color way known as the “lowlands” pattern. It was first employed in Vietnam by reconnaissance and special operations units in early 1967. Mosel’s jacket is also noticeably devoid of all insignia to help avoid identification by enemy forces. After his tour ended, Mosel returned stateside and was assigned to Guard Company at the Marine Barracks in Washington, D.C. (“8th and I”), serving as a part of President Nixon’s security administration in charge of protecting the president and other dignitaries. He was then discharged September of 1971, having attained the rank of Sergeant E-5 and the recipient of numerous decorations, including two Purple Hearts, Vietnam Civic Action with palm, a Vietnam Cross of Gallantry with palm, Vietnam Service with four bronze stars, a Vietnam Campaign Medal, a Marine Combat Action medal, three Meritorious Unit Citations, two Presidential Unit Citations, a Good Conduct Medal, as well as a National Defense Service Medal. Mosel later returned to Western Wisconsin and has since been involved in the start- up of several companies. He is currently the President/CEO of J. Alan Group in Chippewa Falls in addition to serving on the Board of Governors for the United States Marine Corps Association and Foundation. Mosel’s story is just one of over 1,800 captivating personal interviews available to the public through the Wisconsin Veterans Museum Research Center.